The latter is what interested me most. Even though we had a long stretch of Mike-less episodes, this season was very much Deathlok‘s origin story. 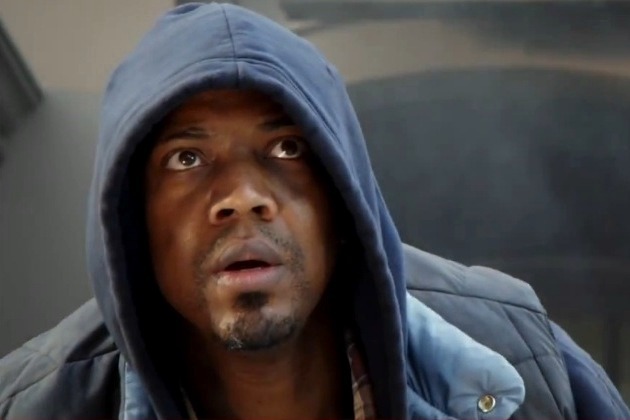 In fact, Mike (J. August Richards) himself says that at minute 30. Mike Peterson and his son Ace are the first characters we meet. We hear Skye’s voice talking about how the world has changed since the Battle of New York, cueing a heroic act by Mike. He exhibits super strength in climbing a building, rescuing a woman, and jumping several stories back to the ground, unharmed. Skye (Chloe Bennet), recording video of the whole thing, starts her pursuit. The relationship between these two characters starts in the diner that Skye revisits in episode 21. Take a look at how different Skye seems in this scene. She’s a giggling fangirl, as excited to meet a real hero as she is determined to protect him from dark forces. “They’re coming for you,” Skye tells him. Who are we rooting for at this point? From Skye’s point of view, S.H.I.E.L.D. are the bad guys. But who is she, really? We’ve just seen Mike act like a good guy. And he’s just so damn likeable. Later in the episode, however, he beats down the factory foreman who laid him off. The bloodied boss pleads, “I’m not the bad guy.” This isn’t a police procedural with black-and-white roles. “This man’s world is about to get very weird. He’s going to need some help,” Coulson says of Mike. Give him the award for Understatement of the Season. Returning to Mike’s story, the revelation about his, um, explosive personality, offers a fitting introduction to the Centipede story and a tie-in with Iron Man 3. The twist in which the damsel in distress is revealed to be a scientist behind Mike’s powers further drives the Deathlok plot. By episode’s end, we’ve got a lot of open-ended questions, and it wouldn’t have made sense if that were the end of Mike’s story, even though it seemed like it was. “Mike Peterson needs to disappear,” we’re told. And disappear he did. For seven episodes. Mike and Ace perform their “we’re a team” call-and-response right as we meet them. In the finale, everything hinges on that phrase! The bit with the truth serum is hilarious. It comes off darker though, when we’ve seen more facets to Ward’s character. Skye knew the name Centipede before S.H.I.E.L.D. did. I had forgotten that; it speaks to her smarts. Coulson references Ward’s family history as an indicator of lack of personal skills. Cobie Smulders and Clark Gregg need more scenes together. It’s hinted that Skye’s name isn’t really Skye. Skye uses an encryption code that is coupled to GPS coordinates. Ward, still recovering from the truth serum, isn’t in the room to hear this, so he doesn’t figure it out right away when she uses the same trick later on… but with a clever twist. I totally forgot that Lola flies at the end of the pilot. So it shouldn’t be a total shock when she flies later on, but I had blocked out that trick, probably because it looks so ridiculous. This entry was posted in 2010s, Dramas and tagged Agent Coulson, agents of SHIELD, Chloe Bennet, Clark Gregg, comics, Deathlok, heroes, J. August Richards, Maria Hill, Marvel, Marvel Comics by meekthegeek. Bookmark the permalink.